...for the first two pages. Oh come on now, no one wants to contribute? The amount of notes is pretty small, when you consider how much music is behind all of it. Very philosophical, but why don't you help out with the project a little. "Ladies and gentlemen, that was the 1 billionth note of Ms. Argerich's career....."
Actually in fact, I know why they wouldn't do it on Argerich. She'd tear them to shreds. You've really got to be kidding! Aha! What do you know - my guess was 15,000 based on the first few pages! So what do you guys think of Argerich? Horowitz? Listen to 3:08-4:00, especially near the end of the passage. That is truly awful. I don't like this piece enough to have a preference. You must really hate it not to have a preference over Pogorelich's. But Liszt is just not that good to me. I enjoy his Consolations and Liebestraums and some of his arrangements of other works (excluding La campanella - yuck), but most of his own virtuosic compositions bore me. Okay - you just called the B minor sonata a "virtuosic composition." I really don't know what to say to that. Much of it is quite Chopinesque, and I don't see how one can fail to be moved by the Andante sostenuto theme. No, I like the sonata. Just don't love it as a whole. And yes, that theme is really good. 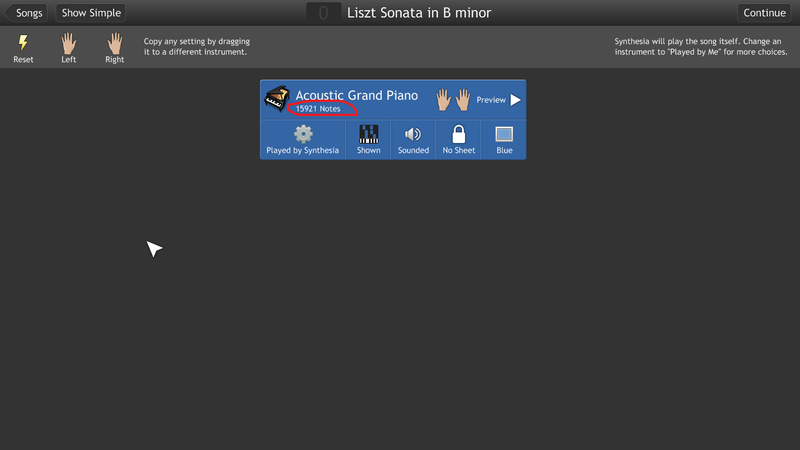 I agree that most of Liszt's big works have too much flash and too little substance, but the Sonata is not one of them. It is fully worthy of standing alongside Chopin's greatest works (well, almost. ). You can count me as another who doesn't "particularly like" the Liszt Sonata. That is to say that I don't like it enough to go out of my way to listen to various interpretations of it; that would bore me. I've heard it a few times. I don't particularly care for its moments of bombast, other moments notwithstanding, even though some consider it one of the great works of the 19th century. I used to be ambivalent towards the B minor Sonata. After some years of dancing around it I came to appreciate how original and influential it actually was, and how well it summarizes all of Liszt's best qualities, and all he had learned about pianistic writing, in one great piece of music. I personally still prefer the Second Ballade's themes, but it isn't quite as remarkable an adventure as the Sonata. All my Liszt needs are met within the Annes de pelerinage, 2nd piano concerto and the odd song transcription. I think it's just In der ferne that really does it for me but that's probably more Schubert than Liszt. In all I think it's one of his more effective transcriptions but not played too often. I do listen to the sonata on occasion because it's one of those things you are always looking for just the right sound. On rare occasion there is a really great performance that makes a great case for it.